We’d love your help. Let us know what’s wrong with this preview of The Labyrinth of the Dead by Sara M. Harvey. Imogen is all that matters. After rescuing her lover from the forces that trapped her in The Convent of the Pure, Portia Gyony has lost Imogen once again to the darkness that surrounds them. The only way to reunite is to walk through the shadow-worlds of the dead and bring Imogen back to the body that awaits her—a journey no nephilim was meant to take. Still seeking out the Imogen is all that matters. To ask other readers questions about The Labyrinth of the Dead, please sign up. Portia Gyony shares her body with an angel, and that gives her power. Power she will need when she enters the underworld to save the soul of her lover, Imogen. Assaulted on all sides by dark forces, Portia must use every tool in her bag of tricks not only to survive, and save Imogen, but to stop the underworld from taking over the world of the living. Can Portia find her way through The Labyrinth OfThe Dead? The Labyrinth Of The Dead is book two of a "steampunk novella trilogy" (The Convent Of Th Portia Gyony shares her body with an angel, and that gives her power. Power she will need when she enters the underworld to save the soul of her lover, Imogen. Assaulted on all sides by dark forces, Portia must use every tool in her bag of tricks not only to survive, and save Imogen, but to stop the underworld from taking over the world of the living. Can Portia find her way through The Labyrinth OfThe Dead? The Labyrinth Of The Dead is book two of a "steampunk novella trilogy" (The Convent Of The Pure is the first book) but stands on its own as a thrilling story of the power of love and the dark forces that would use that love for their own evil purposes. While there are a few things that will be fleshed out for you if you read the first book first, all you really need to know is right here. The characters are full-blooded and compelling, even the bad guys, who are deliciously evil. Sara M. Harvey has built two worlds, the steampunk "real" world (of which we see little in this installment), and the world of the dead, a frightful place filled with horrific creatures who clamor for lost souls, the coin of the realm. Harvey writes cleanly and with style. The story moves at a good clip, but never sacrifices character for action. The love that Portia has for Imogen pours out of every page. But there is more to the story than lost love. Everything, and everyone, comes together at the end for a cliffhanger that has me waiting breathlessly for the next installment. 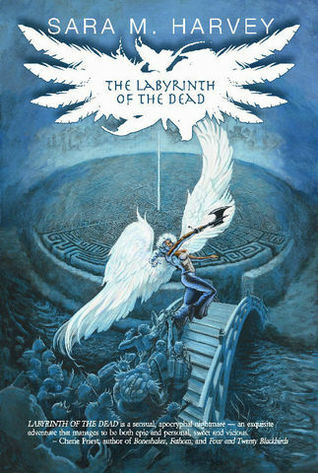 The Labyrinth Of The Dead is a great chapter in what could prove to be a fantastic trilogy. Highly recommended. Sara M. Harvey's novella trilogy is part urban fantasy and part steampunk. Featuring angels, demons and nephilim with surprising little religious content, Labyrinth of the Dead strikes at the same chord as Dante's Inferno. Warrior heroine Portia travels physically to the underworld to reclaim the spirit of her lover Imogen, whose body still lives in the upper worlds. But there are t I purchased this book. Sara M. Harvey's novella trilogy is part urban fantasy and part steampunk. Featuring angels, demons and nephilim with surprising little religious content, Labyrinth of the Dead strikes at the same chord as Dante's Inferno. Warrior heroine Portia travels physically to the underworld to reclaim the spirit of her lover Imogen, whose body still lives in the upper worlds. But there are those to seek to use Imogen as a gateway to the living world. Portia traveling bodily to the Netherworld puts her at great risk, because, as she learns, typically the spawn of celestials and humans by nature go to better afterlifes. But here Portia will learn the truth about her divine heritage, about what becomes of souls when the body dies and she'll face an old enemy and new betrayers in her quest to be with Imogen. Continuing directly from the events of Convent of the Pure, Labyrinth features half-Nephilim warrior Portia Gynoy as she ventures into the underworld to rescue her ghostly lover, Imogen, from damnation. It look me a little to warm to this one - I thought the relationship between Portia and Imogen was one of the strengths of the first book, so to have Imogen mostly absent here felt a little unusual. Once I was able to accept the story on its own merits, though, I found it to be an fun, visceral, s Continuing directly from the events of Convent of the Pure, Labyrinth features half-Nephilim warrior Portia Gynoy as she ventures into the underworld to rescue her ghostly lover, Imogen, from damnation. A continuation of the Convent of the Pure but is also a stand alone success. Detailed imagery and unique outlook. it's hard to find a story that doesn't follow the normal standards. This does it well. This sequel to Convent of the Pure continues what Publishers Weekly had previously said about the first book "cobbles together gothic steampunk fantasy and lesbian erotica in this romantic, necromantic tale."